Indiana State University makes the NCAA tourney! Wait, what? It’s that time of year — spring and March Madness! We’re completely stoked that Indy is once again proving to be a world-class host. As we gear up to have the Final Four NCAA tourney in Indy in a couple of weeks, our city is set to turn in another record performance. If you haven’t seen this über March Madness tourney bracket, don’t miss it — it’s even more awesome in person. Now we’re wondering who’s in charge of filling it out! Like every other business, we started our work week by filling out an office bracket. A couple of us are disappointed that the Indiana State University Sycamores didn’t make the cut. (It’s difficult living with unrequited hope and fading memories of 1979.) But we’re happy to see Indiana well represented by Butler, IU, Notre Dame, Purdue and Valparaiso. And if your alma mater didn’t make it to the big show, you have our sympathy. We feel your pain. If you went to Kentucky, a word of advice: you never know when Cinderella might show up wearing size 12 glass Air Jordans. Social media is a big part of today’s March Madness. 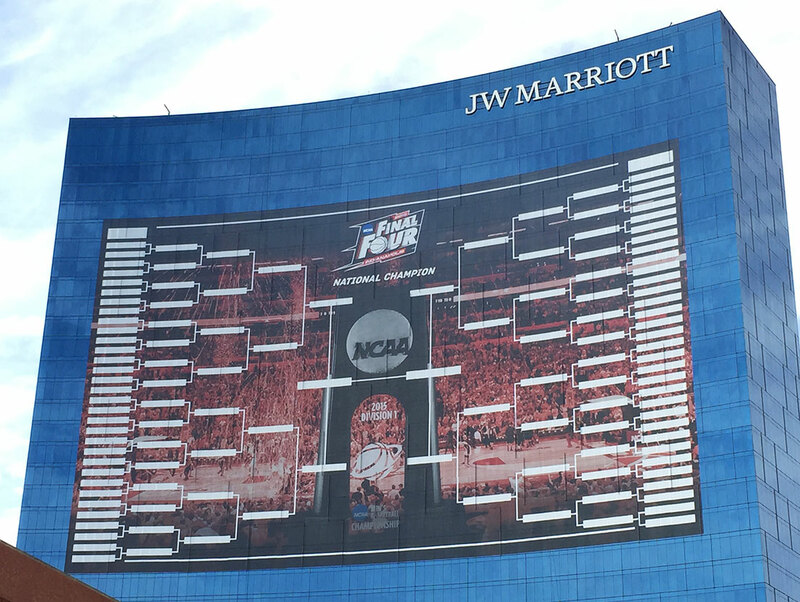 We snapped this picture of the JW Marriott monster bracket when we were downtown last week for a Social Media Networking breakfast hosted by the NCAA. They’ve done a great job of making sure that fans all over the country can stay informed, keep in touch and create a community of all things college basketball. It’s a great reminder of the power of social media and making sure that when you have something to say, you use all the avenues you can to say it, to be heard and to listen to what others are saying. You can also find out what’s happening by downloading the cool Fan Guide. It has everything you need to know about the Music Festival, Fan Fest and more. See you around town! This article was posted in Just for fun, Marketing. Bookmark the permalink. Follow comments with the RSS feed for this post. Post a Comment or leave a trackback.